Heather Hancock, PharmD, MBA, precepts Creighton pharmacy students for Medication Therapy Management and Community Introductory and Advanced Pharmacy Practice Experiences at Baker’s in Omaha. Hancock earned her PharmD at Creighton in 2008 and currently serves as a Baker’s pharmacy manager. Several students said Hancock “was incredibly helpful and motivational, allowing independence, but also being there” when they had questions. 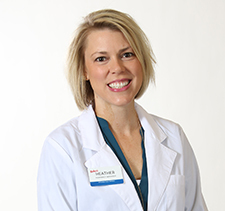 “She is everything you look for in a preceptor and community pharmacist. She has mastered the art of working clinical skills into community pharmacy, all while making time for each student and really getting to know them.” Another said, “She’s a Rockstar pharmacist who has top-notch knowledge and skills, and every pharmacy student should look up to her and aspire to have a pharmacy as well-run as hers.” Students also mentioned that they enjoyed learning from and working with the entire staff at Baker’s: “The staff is amazing,” and “It made it enjoyable to work with such a great pharmacy team.” Hancock was awarded the Preceptor of the Year for Advanced Pharmacy Practice Experience (APPE) local. Ross Belew, PharmD, precepts Creighton pharmacy students for Acute Care, Critical Care, and Infectious Disease Advanced Pharmacy Practice Experiences and serves as a clinical pharmacist at SSM St. Joseph Hospital West in St. Louis. Belew graduated with his PharmD from Creighton in 2012. Several students commented that Belew was “knowledgeable and approachable” and that he and his team taught them “valuable skills that will help me on future rotations and for my career as a pharmacist.” More than once, he and “his team” were recognized for creating a positive learning environment with clear expectations for learning and growth. Belew was awarded Preceptor of the Year Advanced Pharmacy Practice Experience (APPE) distance. Joshua Wollen, PharmD, precepts Creighton pharmacy students for Community Introductory and Advanced Pharmacy Practice Experiences at Walmart in Omaha. Wollen earned his PharmD from Creighton in 2014. Students praised Wollen for his exceptional organization of the rotation and daily discussion topics, and for demonstrating the use of clinical knowledge in community pharmacy practice. In addition to precepting pharmacy students’ rotations, Wollen also volunteers at the student-run Magis Clinic. In accepting this award Wollen states, “I love precepting students because it is a great opportunity to exchange knowledge with the diligent students at Creighton School of Pharmacy and Health Professions. It is my favorite part of practicing. 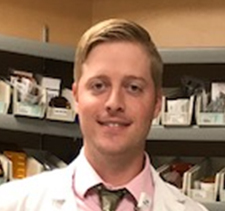 Accepting the role of a preceptor is the most challenging and interesting way to give back and further the profession of pharmacy.” Wollen is Preceptor of the Year for Community Introductory Pharmacy Practice Experience (IPPE 2) local. Daniel Webster, PharmD, precepts Creighton pharmacy students for Community Introductory and Advanced Pharmacy Practice Experiences at Orem Family Pharmacy in Orem, Utah. Webster graduated from the University of Utah College of Pharmacy in 2009. The experience with Webster was described as, “an amazing site for students. Dr. Webster does a great job setting the example of what a pharmacist should be. 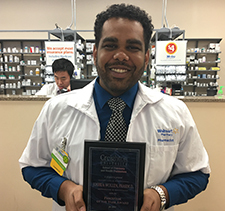 He truly cares about his patients and that shows in everything that he does.” Webster is Preceptor of the Year for Community Introductory Pharmacy Practice Experience (IPPE 2) distance. Mark Harris, PharmD, precepts Creighton pharmacy students for Hospital Introductory and Advanced Pharmacy Practice Experiences at CHI Health Mercy Hospital in Council Bluffs, Iowa. Harris earned his PharmD from Creighton in 1997. When describing their experiences with Harris, students said that he “is well-respected in the hospital, and able to influence the patient care process to validate the role of pharmacists in achieving positive patient outcomes,” and that he “was very approachable and accessible, which enhanced my learning.” They all elaborated on the amount of time that Harris devoted to making sure they were learning what they needed to develop into competent professionals. Harris is the Preceptor of the Year Hospital Introductory Pharmacy Practice Experience (IPPE 3) local.